I knew the moment was coming that Wednesday evening. My dad baptized me when I was little, and I was thrilled and honored to have the opportunity to do the same for all three of my children. I was moved to tears several times throughout the day as I thought about the upcoming moment. My children love Jesus, and this was a moment I knew I wouldn’t forget. But when the opportunity finally presented itself, I was ill prepared. Although I had pictured it in my mind all day long, I had not planned out what I would say. And much to my wife’s chagrin (and my own), my default personality trait is wit and sarcasm. So, because I had not thought through my words for the moment, I ended up being WAY more lighthearted than I had intended. I asked the kids questions like who their favorite parent was and how old Mommy was before getting to the more serious questions and, eventually, baptizing them. 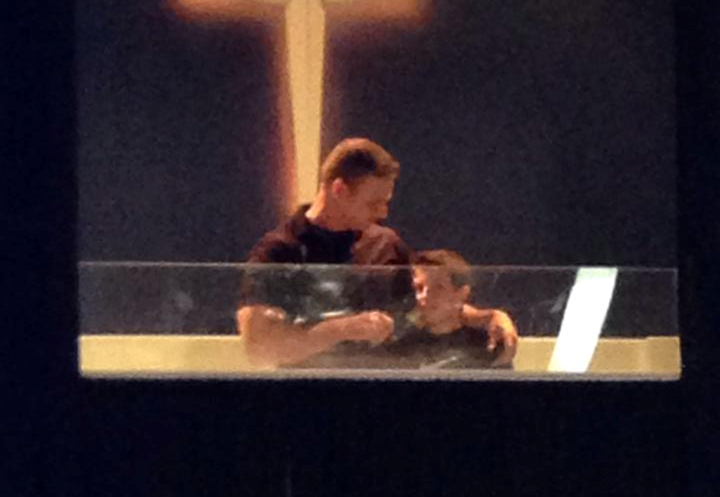 After my first two children were baptized, the third walked into the pool. That’s when my mind began to whirl as I realized I had not said what I wanted to say. I quickly moved through the moment with my third child, and then stepped out of the pool in a dizzying fog of panic. I had taken it all too lightly and didn’t grasp the opportunity at hand. I immediately realized it was a moment I’d never get back. My heart sank into my chest. I wanted to crawl under a rock. My wife and friends did their very best to comfort me. But it’s something I’ll always regret. I had a prime spiritual moment to speak life over my children, and I replaced it instead with wit and sarcasm. As I’ve reflected on this botched opportunity, I’ve realized a few things. I already knew this, but she continually proves it to be true. She comforted me with gentle words of assurance. She said I was the Dad my kids knew, and by making them laugh, I likely made it more memorable for them. She helped me sleep that night. After working through my regret, I realized that one of the reasons I was immediately so stressed was because I was worried about what the people in the audience may have thought. I’m certain several probably didn’t approve of my lightheartedness during the baptism. I don’t blame them, but I can’t control everyone’s opinion. And if they choose to judge me based on one moment in the spotlight, I cannot control that, either. Not to mention the fact that it was all based on fear alone, since I never actually heard anything negative about the whole thing. The day after the botching, I had to appear on two television shows in Atlanta. 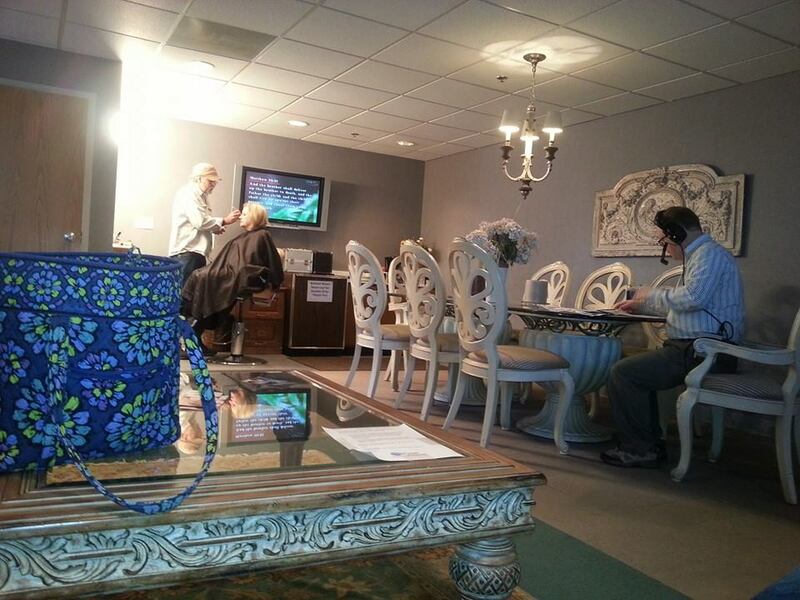 These on-the-spot interviews in front of a camera and a live television audience are daunting. They call for extreme mental concentration. And I woke up that morning unable to concentrate on anything, as I was filled with regret from the night before. I shared my struggle with a few praying friends, and they immediately chimed in with encouraging words. Over the next two hours, I felt the weight of my burden slowly lift. I know it was because they were praying. Although, on one of the shows that day, I admitted on camera that my Xbox gamertag is “wizardbeef,” so maybe they didn’t pray hard enough. My son is 9, and my twin girls are 7. I can honestly say that up till this point, I haven’t had a major regret in parenting. But now I do. And this has made me appreciate more deeply the fact that I’ll only have these babies around once. They’ll soon grow up, and they’ll marry, and they’ll have kids of their own. But that hasn’t happened yet. So I’m going to more fully cherish every moment I have left with them. I’m going to hug them a little tighter tonight. I’m going to shut the TV and the phone and the computer off a little sooner. I’m going to linger at the foot of their beds a little longer when I tuck them in. I’m going to cut my meetings shorter and let the board games last longer. I may have missed one moment to speak into their lives, but I refuse to miss another. I was reminded by many over the next couple days of the following truth: “Your kids won’t remember what you did once. They’ll remember what you did all the time.” I’m reminded of Abraham, Isaac, and Jacob in the Old Testament. Abraham lied twice about his wife being his sister out of fear. Isaac did the exact same thing. And Jacob stole his brother’s blessing and birthright. Yet, over and over and over again God is referred to as “The God of Abraham, Isaac, and Jacob.” These men had great moments of failure. They had flaws and shortcomings. They weren’t prefect, but they were FAITHFUL. One single act will never define us over the course of our lives. We’re not remembered for our one-time actions, but for our repeated actions. I won’t always get it right, but I’ll always try to get it right. In the end, I hope and pray this is what my kids will remember. To be honest, I don’t really remember my baptism. I don’t know what my dad said or didn’t say, I just remember that he was there, and that’s all that mattered. I want my kids to remember me not as a good minister or writer or editor, I want them to remember me as a faithful dad. Thankfully I have a few more opportunities to successfully capture that title. And no matter where you find yourself today, so do you. I did my first Skype interview this week with the National Critics Choice out of Singapore. It was fun to hear questions from around the world. One of the questions asked was “What do you think the keys to successful Christian leadership are?” I came up with a few off the cuff, but I’ve thought more deeply about it since the interview. Here’s what I’ve since come up with. When you have a vision, you want to see it fulfilled. But God rarely allows things to play out the way we think they should play out, particularly when it comes to the things He promises. I hate this about God, but it often feels like God wants the hope of His promises to nearly die within us before He fulfills them. Why? Because of our impatience with such things. When God gives a promise, we often begin looking for ways to fulfill it on our own. We start seeking out man-made avenues of bringing the promise about, or working it out in our own way. When we exhaust all our resources, God finally shows up and does it miraculously. This way, He alone can receive glory for the fulfillment. So the next time you hear from God, be patient, and don’t try to make everything happen all at once on your own. God has a perfect timer. He never lets the biscuits burn. As a Christian leader, there will come a time when God asks you to do something completely illogical, at least, by man’s standards. He’ll ask you to start a new ministry without a paycheck. He’ll ask you to pray for the healing of a woman on her death bed. He’ll ask you to proclaim reconciliation over a long broken and forgotten marriage. Or any number of other things. When you hear the call, get up and go. Others might raise an eyebrow, whisper a few negative notes of gossip, tell you how stupid you are, and turn away, but when you know it’s God, you can boldly and courageously move forward despite all odds. One very important note—you better know it’s direction from God. If you’re not sure, wait until you are. Good leaders know where they want to go, but it can be easy to value the destination over the journey. Often times we don’t care HOW we get there, we just want to GET THERE. We must remember that the journey is just as important as the destination, and at times, even more important. Jesus said a good shepherd will leave 99 sheep to look for one lost sheep. This implies pushing the pause button on the journey. When the shepherd wanders off to find that lost one, the journey is halted, and everything is put on hold. We must be in tune with our followers and understand their needs, their weaknesses, and their hang ups. Understanding such things will help us focus on the journey. We must intimately know the people in our pews. We must hear their opinions, and VALUE them. Then we can plan the proper route to our destination based on their needs. Consider the Israelites in the Exodus story. They had a grand destination awaiting them after a mere two-week journey. But God had them wander in circles for 40 years before they finally arrived. Why? Because the journey was just as important, if not more important, than the destination. Don’t focus so much on the goal line that you forget how to properly run the race. God’s been dealing with me a lot lately about focusing more on people. I’m introverted by nature, so it’s easy for me to withdraw and isolate when I’m surrounded with opportunities to connect with others. But God wants us to be people-focused. That’s all that matters in this world. Your lofty goals, your hopes of success, your buildings, bank accounts, and number sheets all mean nothing. In the end, all that matters will be the ways in which you affected the lives of others for good (or for bad). I’m slowly learning this lesson, and I hope every Christian leader can do the same. In fact, if all you ever learn is #4, I think you’ll be just fine. 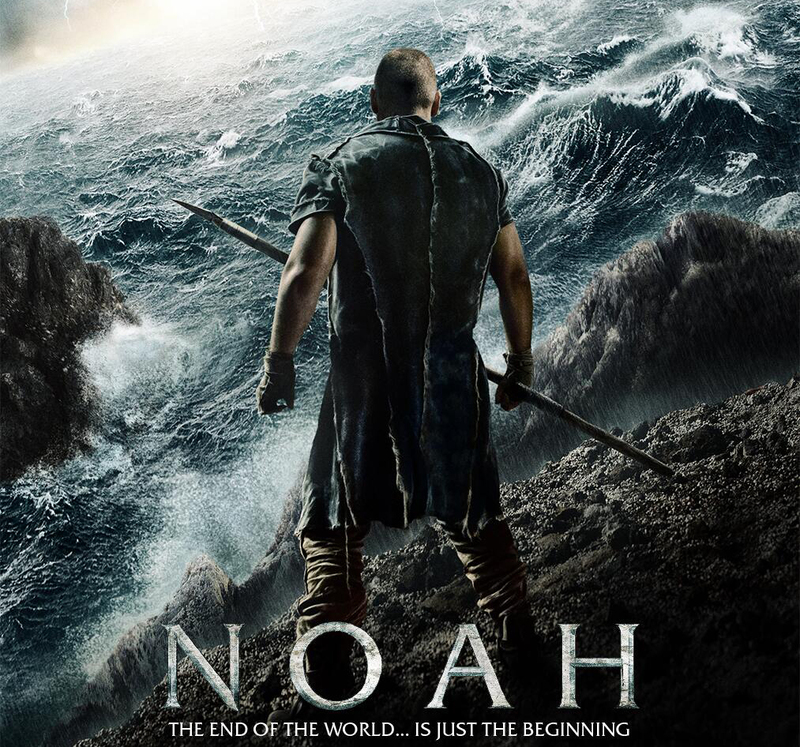 I saw Noah, or at least, I saw a movie about a guy named Noah, who had a big boat and floated along during a flood. Outside of that, I’m not sure what I saw. 1) Noah was a vegetarian? Meh, I like meat, so I wasn’t too fond of this hit right off the bat. And I don’t recall this in the Biblical account. but it let me know right away that they wouldn’t be sticking to the Genesis account. But we can roll with the punches. I know they’ll be throwing a lot of strange ideas into the mix. Everyone has bemoaned the Rock people, but I didn’t mind them so much. They seem to be the writer’s interpretation of the Nephilim, and you can just about make up anything you want when it comes to the Nephilim. I’ve always assumed the Nephilim to be more fraggle-esque than rock-monsterish, but that’s just me. The Rock People made me think of Luke 19:40 when Jesus said, “’I tell you, if they keep quiet, the stones will cry out.’” I figured portraying the Nephilim as Rock People was implying that people refused to worship the One True God, even if they did look a bit ridiculous. 3) God’s the bad guy and fallen angels are the good guys? In the storyline, the rock people were spirits trapped on earth because they came to help humans against God’s will. For this reason, God (or “the Creator” as He is called throughout the movie—the term “God” is never used) seemed to be made into a force that was against humans, not for them. These fallen angels were painted as helpers, while God was the bad guy. 4) The flood saves creation, not humanity? Many had noted in the reviews I read prior to seeing the movie that it had a very loud save-the-earth message. It wasn’t as loud as I expected it to be, but it was certainly prevalent. Noah seemed to believe that God had him build a boat and save the animals because God wanted to save His creation, not humanity. In fact, the story implied that God didn’t care if humans survived at all, as long as creation continued to thrive. This was a major move away from the Biblical account that got under my skin more than other aspects of the movie. 5) God is eerily absent? As mentioned, the term “God” isn’t used in the movie. God never speaks, never shows up, and it appeared that God didn’t even close the door of the Ark, as the Biblical account makes clear. They made a concerted effort to show humans opening and closing the door several times on their own, without the need for God’s intervention. At first glance, this didn’t bother me, because this is how God so often seems to work even in my life. I see hints of Him. I see the miraculous now and then, but I’ve never seen God come down and shut my door or literally show up on my doorstep. I see evidence of Him and of His miracle-working power, but I don’t see Him. I’ve seen enough to make me believe without a doubt, but it’s still a stained and shadowy glimpse of God. But after pondering the movie for awhile, it does bother me. The writer made a concerted effort to show God as EXTREMELY disconnected from humanity, and as caring very little for humans at all. In the movie, God is more worried about vegetables than about human life, and I thoroughly disagree with this take. All that said, I didn’t expect an account that I agreed with. So I got what I paid for. There was a LOT of violence and death, which is to be expected when the entire global population is killed in an instant, but the movie itself was very clean, particularly for a Hollywood blockbuster. So it was fairly family friendly, especially for children at least over 10 or 11. It bugs me how little we Christians actually think about our faith and our beliefs. This movie will force you to process what you believe about God, and how you feel about the story of Him wiping out nearly all of humanity at once. It also makes these great Biblical characters come to life, and makes them human, which they were. As a Biblical account of Noah, I give the movie a flat out F. Other than a big boat, a flood, and a guy named Noah, the most Biblically sound part of the movie was when they showed Noah getting drunk in a cave. Outside of that, it was all Hollywood-contrived storylines. As an almost-family-friendly Blockbuster movie, I’d give it a B-. Since they took so much liberty with the story, they could have done a few more interesting things with it. It felt sort of blah for a blockbuster. So, if you can stomach the off-Bible message, I would suggest seeing it, because if nothing else, it will make you consider your beliefs a bit more thoroughly, which I hope we all do from time to time. 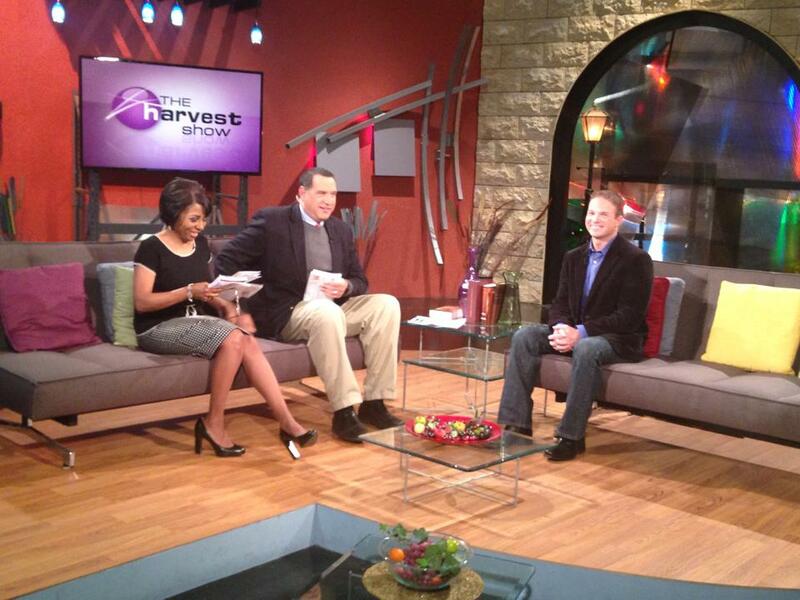 I had my first live television interview recently, and despite those pesky Teletubbies, I lived to write about it. To stop the madness, I had to bury that memory deep into the recesses of my mind. So I carefully stuffed it right next to the place where I bury all my Teletubbies nightmares. Fast forward a few months. I receive an email from my publicist informing me that The Harvest Show out of South Bend, Indiana would like to have me on for a LIVE interview about my book! The evil, deeply buried memory of that promo page immediately came to mind, and suddenly I wished I hadn’t buried it so deeply, because now I had to deal with the reality of such an appearance. Thankfully the Teletubby nightmares remained at bay during the madness. God knew this would have simply been too much for my fragile soul to handle all at once. Then came travel-to-South-Bend day. My wife was tagging along, and our flight was supposed to leave out of our local airport, connect in Atlanta, and lead on to the Promised Land at the Home of the Fighting Irish late that night. But our local flight was delayed several hours. After scouring the Internet and waiting on hold for what seemed like an eternity, we finally were able to rebook the flight, but now had to drive 2 ½ hours to Atlanta to catch the connection. It was a pain, but we made it to our hotel under the shadow of Notre Dame, and slid into bed before midnight praying the Teletubby nightmares would remain buried through the night. We got up early to have breakfast and do all the things one does in the morning before a live television interview–trim ear hair, trim nose hair, pop zits, marvel about how much fatter one looks an hour before television, pray God would miraculously remove 10 pounds before taping begins, double check ear and nose hair, wonder if they’ll apply stage makeup before the show, pee till you’re dehydrated and hope you don’t have to go during the interview, triple check nose and ear hair, etc, etc, etc. Upon arrival at the station, we were ushered into the Green Room where we met the other guest (also an author) and waited for our makeup (a phrase I thankfully don’t use very often). We watched the show from stage left as it took place. I was on during the second half. I put on the smile, shined the pearly off-whites, and tried to answer questions as best I could. Then, just like that, it was over. As we were readying ourselves to leave, they asked if I could stick around for an encore interview that would be aired at a later date, so I must not have done all that bad. I left the experience and began to breathe easy again, knowing I had survived the ordeal and would live to tell about it. But the next day, the first email I saw was a request for another television show out of Atlanta. I guess this sort of thing has a snowball effect. I should admit that the interview wasn’t perfect. I had a major flub. At one point I began to share a favorite quote of mine on faith and when I went to spit it out, there was nothing there! I can only assume one of the Teletubbies got loose and stole it. My money’s on Tinky Winky. He’s always the instigator. If you’re interested in seeing the interview, you can watch it by clicking here. I’m on at about the 36 minute mark. 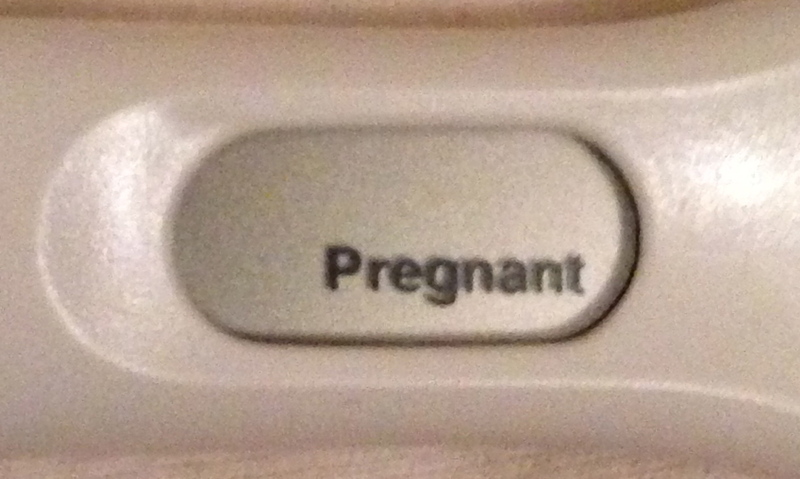 My wife recently tried to prank me with a positive pregnancy test. She failed epically, but her attempt was priceless. I’m not sure when the wifey had this brilliant idea, but she decided to show me a positive pregnancy test for April Fool’s Day. After pondering how she might pull this off, she decided to pull her pregnant friend into the ill-advised prank. A few weeks ago—DURING CHURCH SERVICE—my wife brought a pee stick and left it in her coat. Whilst everyone else was partaking in the worship of our Lord and Savior Jesus Christ, her preggo friend snuck out to the coat rack, took the pee stick, and headed to the bathroom. She then did her business—DURING CHURCH SERVICE—and returned the stick to said coat. She reentered the worship of our Lord and Savior Jesus Christ as if nothing had happened. And I found out this morning she didn’t even tell her husband what she had done for my wifey. Wives can be so diabolical, especially during church service. Wifey took the positive pee stick home, but realized after a few days it was no longer showing positive. I must assume that most of us have no idea these things have a shelf life, because no one in their right mind would wait two weeks to show their husband a positive test, right? So, now that the fake-prank-positive-test no longer showed a fake-prank-positive, she had to return to the drawing board. Wifey and the Preggo returned to their underground evil bunker lair to cunningly revise their wicked plan. What they came up with was even more diabolical, and shockingly, 100 times more disturbing. This is where the story takes a really, really ugly turn. WARNING: what you are about to read is unfortunately 100% true (NOTE: after Wifey read this, she claimed I had a few details wrong, but once you’ve read the following, you won’t trust her either). At some point, Preggo peed in a bag. She then placed the pee bag in a second bag for leakage protection. And it had HAZARDOUS marked all over the plastic. They then proceeded to do another bait and switch last Sunday—DURING CHURCH SERVICE—yet again. They used the old put-your-bag-of-pee-into-your-friends-coat-during-church-service-trick. And apparently they pulled it off to perfection. After worship of our Lord and Savior Jesus Christ had finished, Wifey brought the hazardous pee bag home and hid it in the darren-has-no-clue-where-this-is-spot (which I need to find immediately). Then, as a precursor to her evil set up, Wifey began complaining about her stomach for a few days, saying she was feeling sick—nauseated, even. The morning-o-diabolicalness, as we were getting dressed, Wifey walked into the bathroom and I heard her lock the door. I noticed this because it seemed a bit unusual. She doesn’t normally lock the door. But again, I breezed over it like any loving, thoughtful, caring, intelligent, handsome, and abundantly clever husband would do. I then headed out to the kitchen for my morning cup-o-joe. Whilst preparing my morning cup-o-joe from our Keurig (which I love, btw), Wifey came out in a panic. Her face looked heavy. Her words were dropping like 20 pound weights. She muttered, “I know why I’ve been feeling so bad lately.” She then put the fake-prank-positive-pee-stick down in front of me. I looked up from the Keurig (love) for a moment, and looked into her eyes again. The look of panic on her face seemed a little contrived. I’m not buying this. Do they sell fake-prank-pregnancy tests? They must, I’m certain this isn’t real. WAIT A MINUTE…WHAT DAY IS THIS? So, today is April 1. That means it’s April Fool’s Day. I turned back to the Keurig (love), threw the stick to the back of the counter and said simply, “Baby, it’s April 1st.” And that was the end of it. After punching me in the back, she then proceeded to tell me these HIGHLY disturbing details that I’ve now shared with you. I almost feel bad for not falling for it, considering all she—and her preggo friend—went through to make it happen. But as I continue to think about it, I realize I don’t feel all that bad. But what I do feel really bad about is the fact that for about 15 years now, I had no idea my wife could be so rabid-rabies-raccoon-crazy. When you say to spend a lot of time trying to know Jesus, what does that mean to you personally? The first, and perhaps most important, thing knowing Jesus means to me is that I BELIEVE. I truly believe Jesus is who he said he was—the son of God. And then, I believe all the craziness behind the story of Jesus, ya know, that bad-B movie storyline we Christians call the Gospel story. It entails a virgin birth, a sinless life, a criminal’s death, a resurrection (ahhh zombies!) and an ascension back into heaven. And I believe every word. So, when I say I know Jesus, it first means I believe in Jesus as the resurrected Son of God. A lot of Christians kinda stop there. They say this is the key to what they call “being saved.” These Christians want you to repeat a prayer saying you believe all this stuff and ask for forgiveness of all your sins. Then they say you’ve punched your ticket into heaven. But I’m not sure I buy it, exactly. I think once you truly begin to believe, there’s a process of knowing Jesus that must continue. So why do I need to know him more? Many play on people’s fear of the unknown by saying that if you die and don’t follow or believe in Jesus, you’ll go to hell. While playing on such fears is an effective method to get a response, I think there’s a much better answer. I believe Jesus offers abundant life, eternally yes, but also right now. I can honestly say my life is FANTASTIC! Not because everything’s perfect, or because I’m super lucky, or because I’m ridiculously good looking, or because Duckbilled Platypuses do actually exist, or because my kids are perfect (b/c none of those things are true, except the platypus part, for which we’re all grateful) but it’s fantastic because I follow Jesus. My life isn’t perfect by any means. My dad died when I was 26 from cancer. My son has a seizure disorder and he takes medicine twice a day. And we’ve been digging ourselves out of our Godzilla-sized medical debt for years now. So following Jesus doesn’t mean my life is perfect. But it means I can have peace even in the midst of imperfection. When bad things happen, my faith is my shield and shelter. I trust God’s plan. I trust he knows what he’s doing even when I have no freakin’ clue. This faith and trust become a shelter in the midst of life’s storms. Jesus gives me peace, and therefore I can have an awesome life even when life isn’t so awesome. And what should I do with it once I know it? So, I believe in Jesus, but what am I doing to make that belief a reality? For instance, if I say my wife is the best cook in the world, but I refuse to ever eat her food, do I truly believe what I claim to believe? Simple analogy, but it works for me. So I say Jesus is the resurrected Son of God, but what am I doing to prove it? This is where the Bible comes in for me. In the Bible, Jesus called certain people (the twelve Disciples) to be an everyday part of his life. When he called these people, he always said the same two words, “FOLLOW ME.” These twelve disciples had to leave their normal, everyday monotony and become a part of Jesus’ life. So when I say I’m a disciple of Jesus, these two words, “Follow Me”, encompass my entire identity. I am a follower of Jesus. It’s not just a simple prayer. It’s not merely a belief. It’s an everyday responsibility that leads me to know Jesus and to know more about Jesus. My belief leads me to action. For me, the Bible is where I find all I know about Jesus and God (well, I guess I’ve learned some from simple experience, as well). It’s where I can read what Jesus taught, how Jesus lived, and who Jesus was/is. There I can find and gain some understanding into what it means to truly be a follower of Jesus, i.e., a Christian. But that’s not all—the Bible certainly helps me know Jesus, but the best part of the whole thing is, I don’t just read Jesus’ words spoken thousands of years ago, but I can talk to him even now. Since I believe he is actually living, and since I believe he also created the world (and me), I spend time in prayer, talking to Jesus. I tell him all my needs and let him know that I really, really want to be better than I am right now. I spend time asking for forgiveness for the moments I’ve acted selfishly and out of line with his purpose for my life. I pray for my friends who are hurting or in need. I spend time asking my questions and letting Jesus know that I’m listening if he ever wants to speak. It hasn’t happened all that much, but I can honestly say I’ve heard his voice a handful of times. And when I have, it’s always been a life altering, unforgettable, stop-me-dead-in-my-tracks kind of moment that changes my emotions and way of thinking. I love hearing his voice. And of course, knowing Jesus means participating in all the so called spiritual disciplines such as prayer, fasting, bible reading, worship, etc. This is what I believe separates the weak Christians from the strong ones. Those who do these things regularly are often much more unshakeable in their faith than those who don’t. And is there anything else I should know? When I say I know Jesus, it also means that I’ve accepted the fact that…he knows me. He knows I’m a failure. He knows I’m weak. He knows I’m flawed. But I’ve realized that he loves me anyway, in spite of my selfishness, my sins, and my pride. He loves me in spite of the fact that I seem to come up short of his perfect plan so often. Although Jesus knows how ridiculously stupid I tend to be, he treats me as if I’m his most beloved creation…because I am. And so are you. When I say I know Jesus, it means I am free…free in every sense of the word. I’m free mentally, emotionally, and spiritually. I’m free because I’ve realized a couple things: 1) I am a sinner (to the worst degree), 2) I am forgiven. This is a hugely freeing realization. I don’t have to carry the weight of my past mistakes and failures. The punishment that I deserve from God was placed squarely on the shoulders of Jesus as he hung on the cross. So rather than the punishment I so clearly deserve, I receive forgiveness which I so clearly don’t deserve, and what could ever be more freeing than THAT? Now, before I end up writing an entire book, let me try to sum this all up. I believe I am a sinner. I believe Jesus, the Son of God, died and rose again and in so doing took the punishment I deserved on himself. And by believing this, and letting my actions continually prove my beliefs, I follow Jesus. For this reason, I am a Christian. That’s what I believe, and that’s what it means when I say I’m a follower of Jesus. The main question for me is always, “Do I want to live this crazy life without Jesus, or do I want to live it with Jesus?” He’s helped me through so many difficult moments, my answer is easy. I’m rolling the dice with Him. 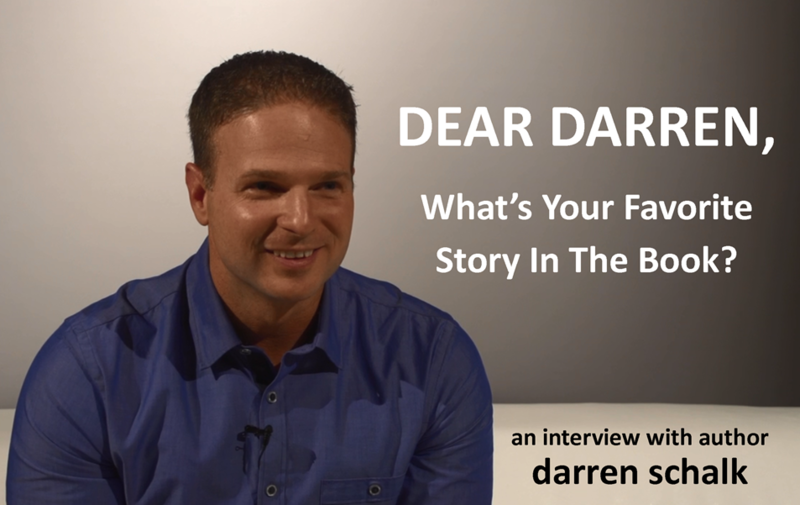 I recently had a Q and A video session about my book. Some great stuff came from it, and we’ll be sharing it in three parts. Here’s the first. It’s a TRUE story that I promise will knock your socks off! Enjoy! I’ve come to realize recently that only two things truly freak me out. They are 1) the big hairy muppets with wide eyes that appear to be cut directly from satan’s body hair, and 2) live interviews. There’s an entire chapter in my book about how often I stick my foot in my mouth. I was raised in a home of 4 boys, and no girls. It was the kind of setting where anything goes. My high school social group lived by the motto “if it’s funny, say it.” These childhood influences have led me to many highly embarrassing moments that have left me picking toe jam out of my teeth. Thankfully over the years I’ve begun to develop a sarcasm filter. But filters have to be renewed every so often. Every time I replace the air filter for my furnace I see ungodly things and wonder how we breathe at all, then I wonder if our children should be taken from us because I’m a horrible parent who lets them breathe air filtered through something that I wouldn’t let the dog sit on (if we had one). Of course if we did, I’m sure I’d forget to feed him and he’d die an untimely death while breathing air filtered through a 9 year old, dust-mite-covered square-o-muck. And sometimes my sarcasm filter gets just as mucky. So the sarcasm doesn’t always get filtered as it should. This is why live interviews scare the muppet out of me. So, I had my first live one this week. Thankfully, my sarcasm filter was fresh, new, and in full effect. My heart was beating out of my chest as I held the phone to my ear listening to the commercials, waiting for the interview to begin. I thought you’d get a little prep time for these things, but you don’t. They call, ask you how to pronounce your name, and you’re off to the races. But the interviewer, Bob Dutko, made me feel comfortable, and as soon as I opened my mouth my nerves calmed. Apparently I’m more comfortable with talking than I care to admit. I just booked three more live interviews for next month (one is even a video by skype) so stay tuned to hear if my sarcasm filter continues to function properly. If it doesn’t, this might be a train wreck waiting to happen. We pray God will let the sarcasm filter continue to function for Darren much like the bush continued to burn for Moses. If you’d like to hear the interview, you can below. My publisher sent me a whole page of rules about such interviews, and one of them stated that I’m supposed to match the tone of the interviewer. For that reason, I didn’t get to be all that funny, but it felt pretty good. Although, I always fear that people who read my stuff and then meet me will say, “He’s way funnier on paper,” and that’s probably true. It seems the sarcasm filter works on spoken words, but not on written words. 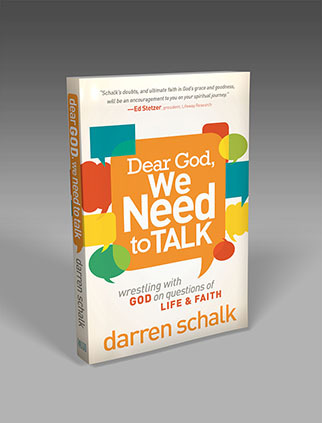 The Christmas tree lot is a fitting place to open the first chapter in Dear God We Need to Talk, because author Darren Schalk has one goal in life. He wants to win an argument with his wife. Or with God. Whichever comes first. Schalk isn’t the kind of guy to bring Jesus to your door with stern pamphlets and prayers. 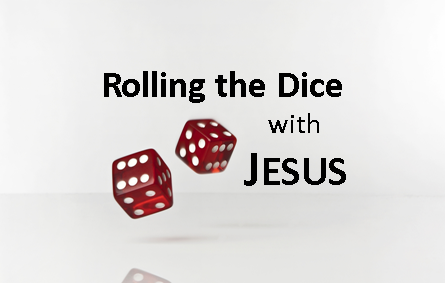 Instead he brings Jesus through funny, neurotic, and disarming stories that will be amusing and charming to even the most irreverent of readers. Schalk also does the heavy lifting in his writing, both in his honesty and his faith. He doesn’t shy away from tough subjects. He can’t. He’s lived through them just like the rest of us. He always finds God at the end, even if God has had to pull him through kicking, screaming, and arguing. And that’s okay. Questions are okay. Dear God We Need to Talk is a breath of fresh air in a genre that can be known for its stuffiness. Schalk’s exploration and questions of life and God are at once open-minded, smart, and grounding. This is an enjoyable read and ultimately an inspiring one. 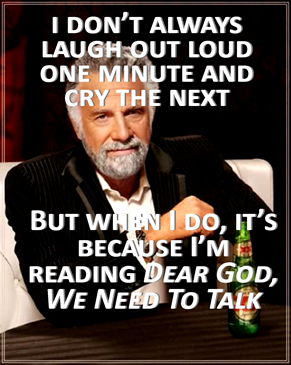 You find his stories funny, his candor refreshing, and you might just find yourself talking with God, too. Thank you “Anchovies” for this humbling review!